It seems that in Nebraska we are all very familiar with our friend the zucchini – although we may not always spell it correctly. 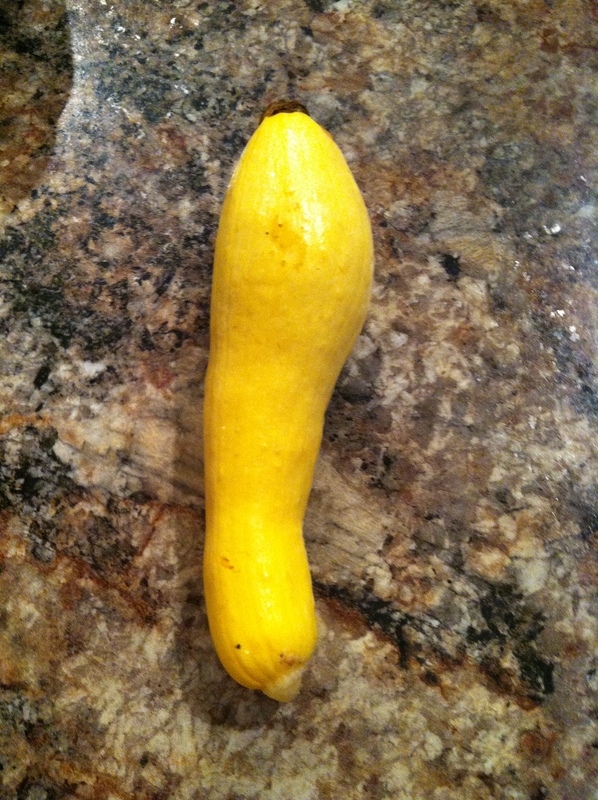 However, one of its relatives – the yellow squash – is grossly under used. Summer squash is a term for squash that is harvested at a tender, immature stage. It has tender skin and does not require peeling like a winter squash. Most of the nutrients are just under the skin, so try to cook with the skin on. Summer squash comes in many shapes , colors and sizes. Zucchini and yellow squash are just a couple types of summer squash. 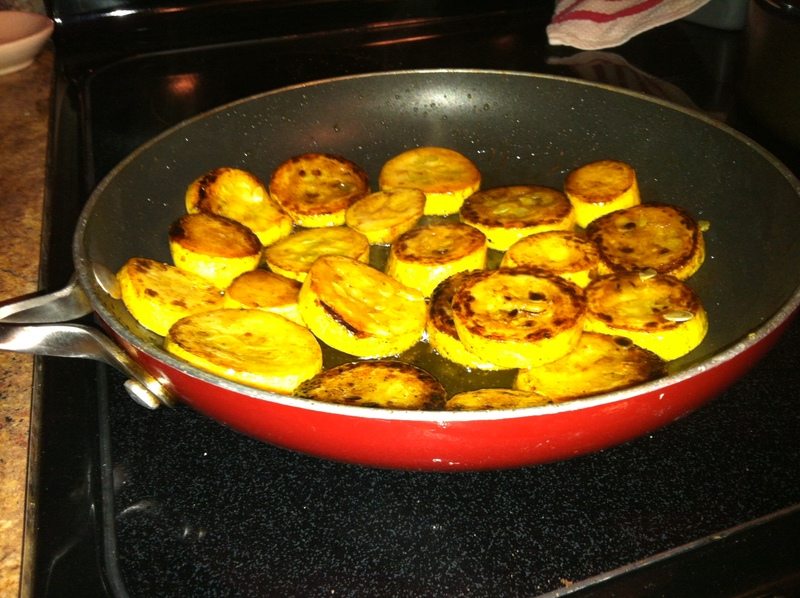 Try cooking your yellow squash just like you would a zucchini. Zucchini seeds, as we know them today, were primarily developed in Italy even though summer squash can trace its ancestry to the Americas. How to Choose: The stem end of a squash will tell you how fresh it is. Ideally, there should be a little juice coming out of the stem, indicating that it was recently harvested. Steer away from limp or very scratched squashes. The skins should be tight, shiny, and brightly colored and will scratch easily with a fingernail if fresh—handle them gently. How to Keep: Keep squashes in a plastic bag in the warmest part of the refrigerator. Meet Laura. Laura has been part of Pekarek’s Produce since 2010. 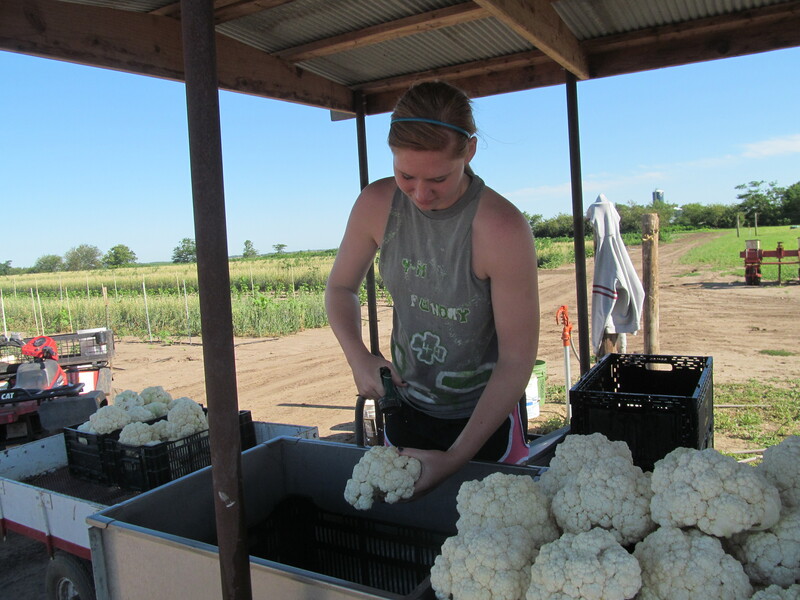 She is a college senior at UNL majoring in Horticulture. We are so lucky to have someone returning to the operation with so much knowledge and a great work ethic! 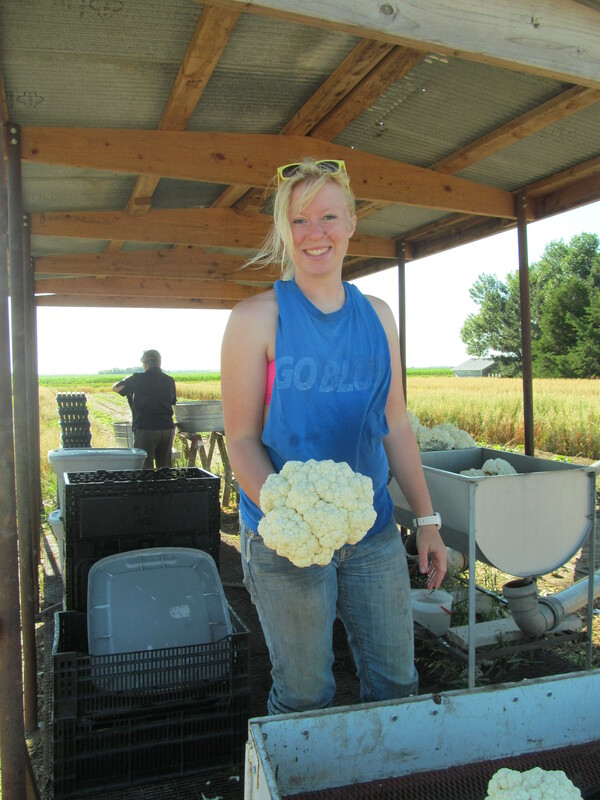 In this picture she is showing me the beautiful cauliflower harvested this morning. You might not know this, but we get pretty gosh darn excited when something grows that is this beautiful, heavy and tasty! Laura is standing on our current wash station. If you look closely you can see that we are standing under the shade with a stainless steel tank for washing and a discharge pipe that sends water out to the field. The bottom of the wash station is a grate so that our feet stay dry when water is inevitably spilled or splashed. This is a huge improvement over the way we used to wash – hopping from pallet to pallet and then washing produce in a metal wash tub! And this is what is even more exciting!! What is it you ask? Well it is still on it’s side and it connects in three parts. Enough clues? It’s a brand new shiny wash line!! 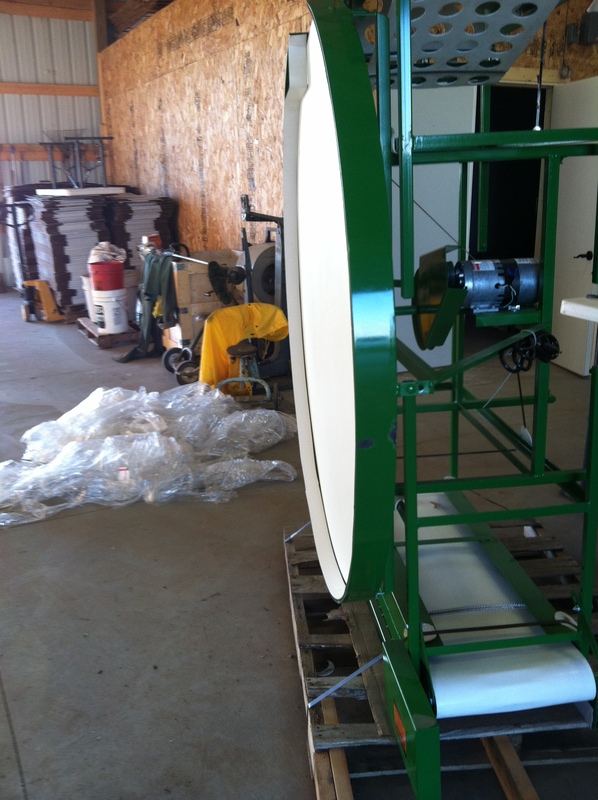 This should help us improve our washing efficiency greatly. It seems like we are constantly making leaps and bounds! If you are new to Seward then you may not know that Seward is America’s Small Town 4th of July City! There is something for everyone on the 4th – from music to crafts to a freedom run to a parade, rides and of course: FOOD! More than 50,000 people venture to Seward on the 4th of July, which is great for the town! But if you are trying to pick up your CSA bag from JD’s Coffee Shop, it might be all but impossible. That said, next week we will be doing our CSA bag pick up on TUESDAY, JULY 3 from 3 – 6 pm. If you need to make other arrangements, please call or email Pekarek’s Produce. Let’s all have some roasted carrots tonight! These are great finger food for the kids. Cut the carrots to desired thickness. I like 1 1/2 inch thick slices as the carrots will shrink while cooking. Toss them in a bowl with the olive oil, salt, pepper, and dill. Transfer to a baking sheet in a single layer and roast for 20 minutes until browned and tender. 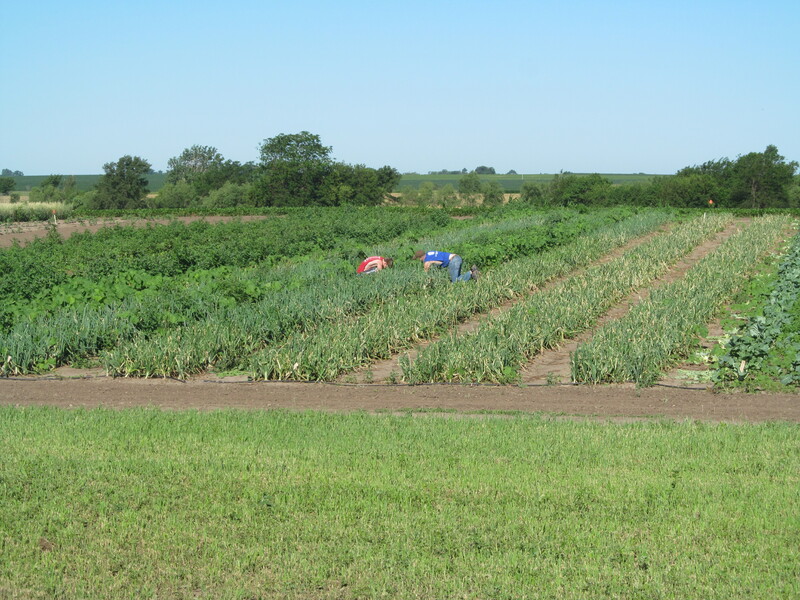 This has been a wonderful week at Pekarek’s Produce – yes it is exceedingly hot, but it has not hailed. Ryan and the crew have been busy pulling weeds, staking tomatoes, cleaning out vegetables hit by the hail, picking, and washing. They especially had fun walking the potatoes pulling the sunflowers out! Fun is my word. 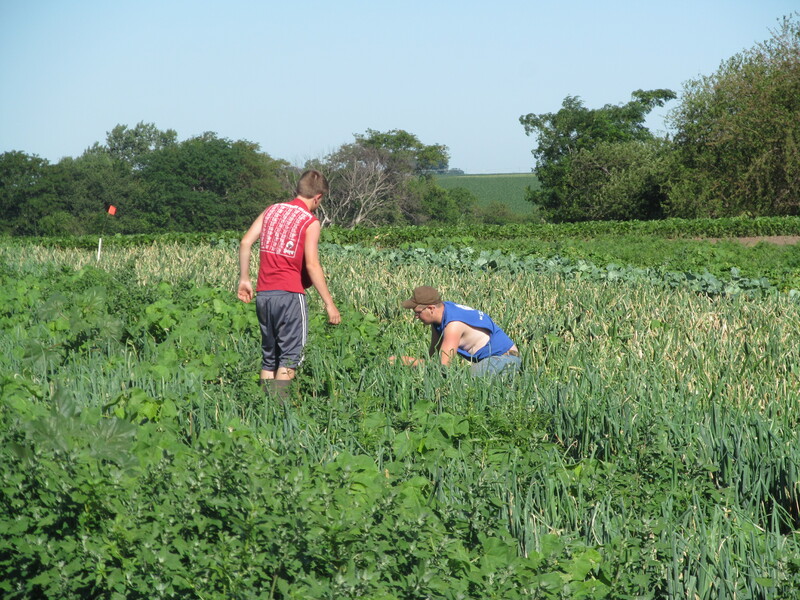 Check out how hard the boys work pulling weeds! To keep cauliflower heads white, or to blanch them, you need to tie up leaves around the head while it is growing. This keeps them tasting sweet and a creamy white color. Due to the festivities in Seward next week ( 4th of July) the CSA bags will be available for pick up on Tuesday from 3 – 6 pm. We will return to our normal schedule at this point. Check out this week’s roasted carrot recipe! If you have a recipe to share, email it to pekareksproduce@hotmail.com or include it in the comments section. As always, if you have any questions, concerns or suggestions send us an email or give us a jingle and we’ll get back to you as soon as we can. We hope everyone is enjoying their bags of produce. We are having a great time hearing from each of you about how you are using your vegetables. 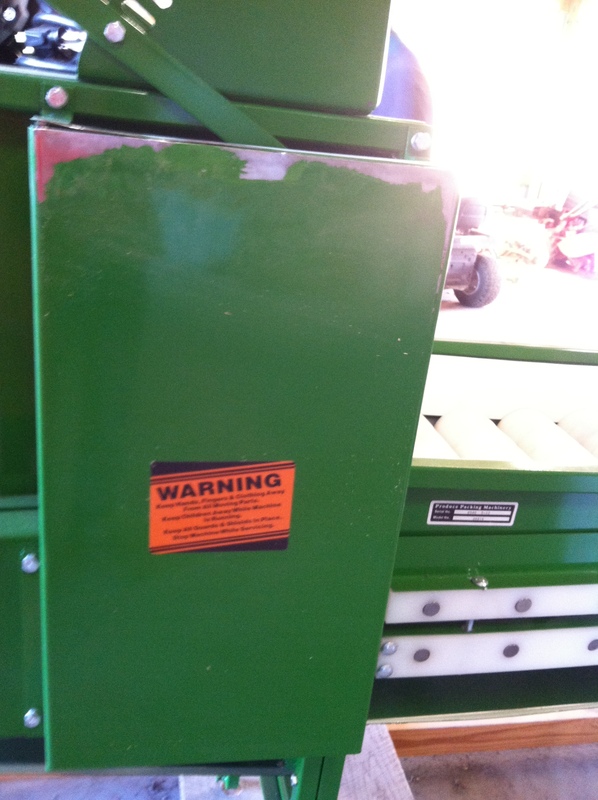 So, last week was one of those weeks where there was a lot of anxiety on the farm. For those of you that were paying attention to the weather last week, Thursday was kind of wicked. And as I get stressed out over every storm in the spring, Ryan lives by the mantra “it is what it is.” Unfortunately, what it was, was hail. Farming is definitely not for the faint of heart. So what did the hail do? Prepare yourselves, because the hail (pea size to ¾”) did a significant amount of damage. Let’s start with lettuce and spinach – it’s done. The hail completely wiped it out. The tomato vines are torn up, often splitting at the growing point. Most of the fruits on the tomato plants were scarred, so they had to be stripped. At a minimum we lost 10 – 14 days on the growth of both tomatoes and cucumber. The hail punched up the zucchini, so two picks have already been thrown out. Some kohlrabi are split open. The potato vines have been beat up. Where hailstones hit the broccoli heads, there is a brown dead spot. Several have already been thrown out. The leaves on the sweet corn are stripped, but they should still make a crop. The leaves on the cabbage plants have been torn up and some of our green beans got deluged with water near the high tunnel. We’ll probably be seeing damage all season. All that said, farming is definitely not for the faint of heart! 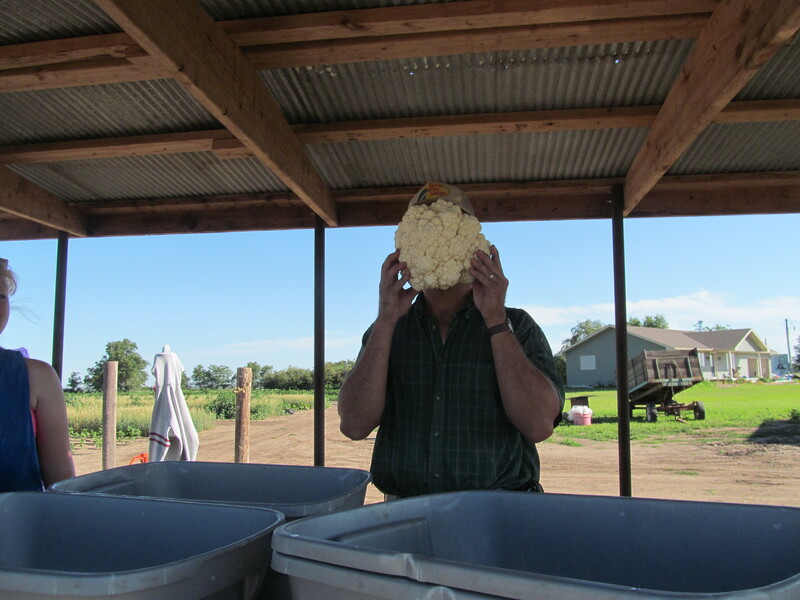 But in spite of the stress, we really enjoy growing nutritious food. Sweet Pea Substituted Potatoes due to hail! This week, try your broccoli as Broccoli Salad – you won’t belive how EVERYONE gobbles it up! It’s almost hard for this to be called a recipe because it is just so simple and delicious. Wash the potatoes and slice in to 1/8 inch thick slices. Chop green onions. Place 2 Tbs oil in a skillet and heat. 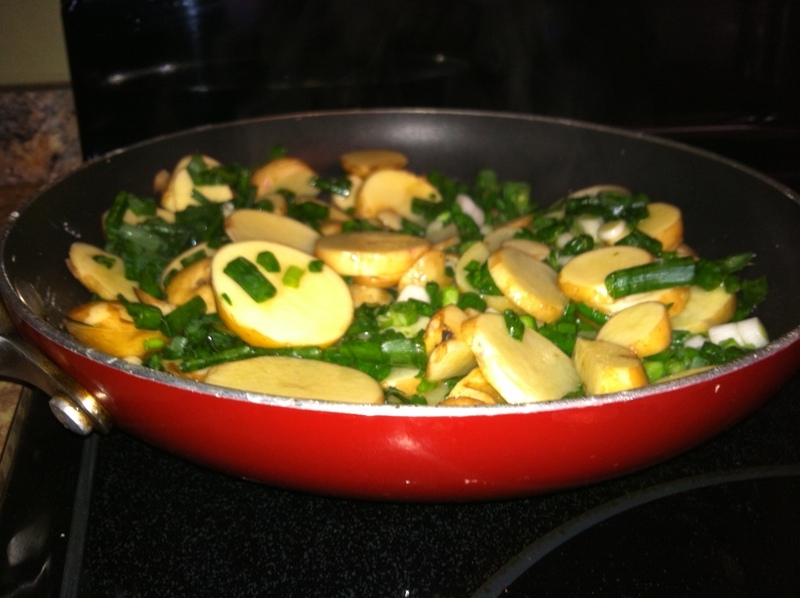 Place the garlic in the pan and cook for 3 – 5 minutes. 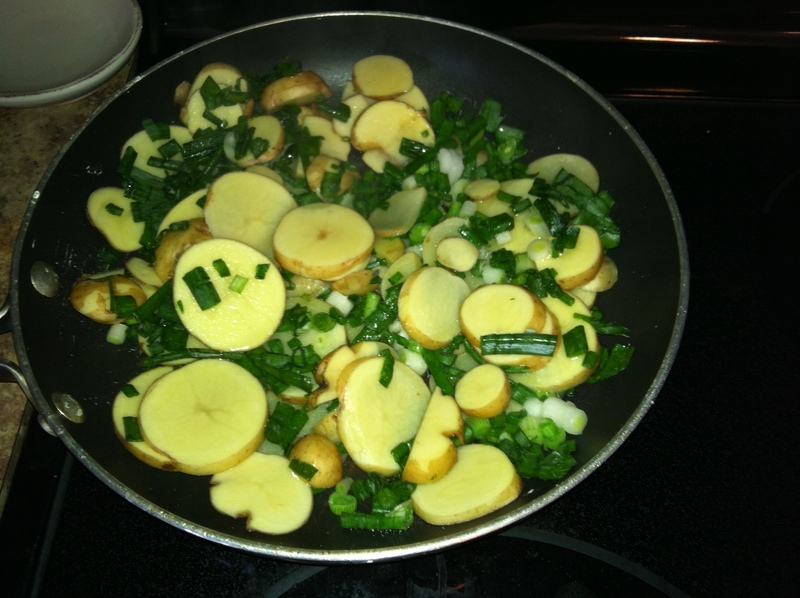 Add the potatoes and green onions in the pan with salt and pepper to taste. Turn the potatoes occasionally to prevent burning with a flexible spatula. Cook for 20 – 25 minutes. Yield: 6 servings. I don’t think anyone has to ask what to do with potatoes. Bake, boil, mash or fry, a potato can be delicious – even if you spell it with the extra “e.” Potatoes are the highest consumed vegetable in the U.S., only behind corn. You know, it seems potatoes got a bad rap from fad diets like the Atkins diet, which encouraged dieters to abandon carbohydrates. But did you know that a medium sized potato has only 110 calories and has NO fat, sodium or cholesterol?? They are also a great source of potassium, fiber, vitamin C, vitamin B6, and iron! Vitamin C is an antioxidant that aides in collagen production; assists with iron absorption; and helps heal wounds and keep your gums healthy. Vitamin C may help support the body’s immune system. Soluble fiber may help with weight loss as it makes you feel full longer, and research has shown it also may help lower blood cholesterol. Vitamin B6 is a water-soluble vitamin that plays important roles in carbohydrate and protein metabolism. It helps the body make nonessential amino acids needed to make various body proteins; it is a cofactor for several co-enzymes involved in energy metabolism; and is required for the synthesis of hemoglobin – an essential component of red blood cells. Iron is a major component of hemoglobin that carries oxygen to all parts of the body. Iron also has a critical role within cells assisting in oxygen utilization, enzymatic systems, especially for neural development, and overall cell function everywhere in the body. So you just can’t go wrong with a potato! If you’ve ever noticed, the recipes from Pekarek’s Produce are pretty simple. That’s because most of the time, our favorite way to eat the vegetables is raw or with some sort of dip. In that spirit, I present to you my recipe for Broccoli Salad. This originally came from my mom’s church cook book, but has become second nature in our house. Many people add raisins, but this is frowned upon in our house, so we keep it simple. Remove the tough stalk at the end, trim leaves off, and wash broccoli head thoroughly. Cut the head into florets and the stem into bite-size pieces. Place broccoli, crumbled bacon and green onion in a large bowl. In a small bowl, combine the mayo, apple cider vinegar and sugar. Add to broccoli mixture and toss gently. Like many of us, we would like to eat healthy, but sometimes it seems so difficult. Summer is a busy time for all of us, but it is also the time when a huge variety of vegetables come into season. 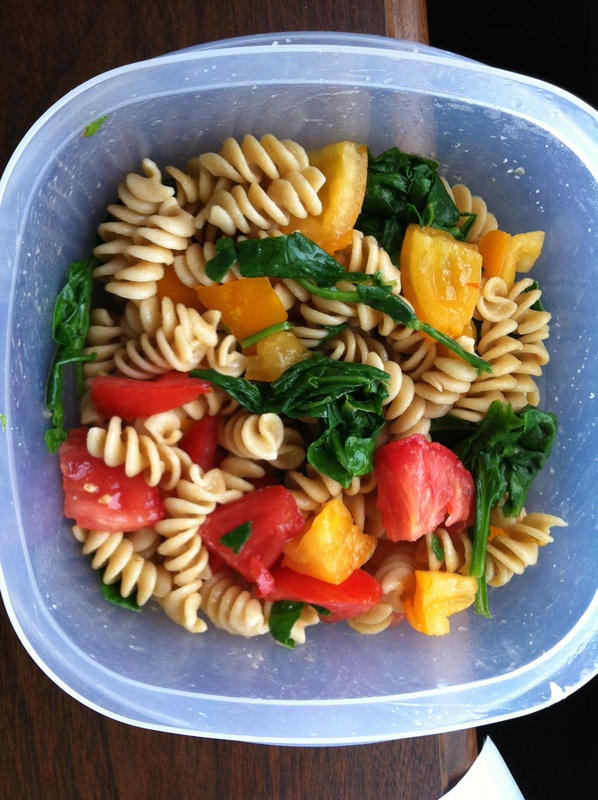 So here is a simple way to incorporate your veggies into a 12 minute meal! Cook the whole wheat rotini noodles as directed on the package. Usually 11 minutes to cook these babies. Mean while, tear/cut up your 2 cups of spinach and put in a bowl. Dice/chunk the red and yellow tomatoes. Add to the bowl. Next add your whole wheat noodles. Now put on 1 Tbs of dressing/oil/butter and salt to taste. Look – your done in only 12 minutes 🙂 AND you could go crazy with this idea… think peppers, onions, green onions, etc. But if you think you can’t go without meat, serve this as a side dish or cut up a chicken breast and bacon to mix in.